- Measures: Width: 195 cm Depth: 056 cm Height: 205 cm Weight: 990 kg - 2 year Guarantee! - Free Shipping! 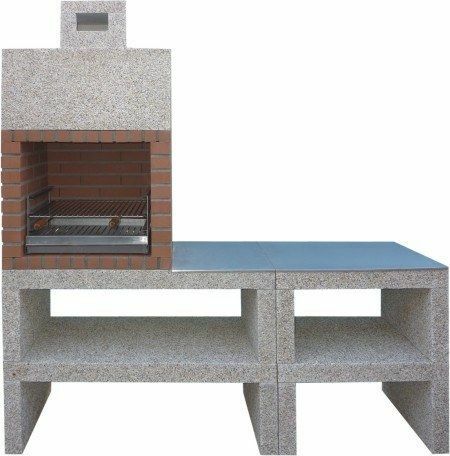 Modern Barbecue AV730F. Free shipping to England, metropolitan France*, Monaco, Belgium, Luxembourg, Italy and Spain. For other destinations please contact us. Take one ripe pineapple, skin and cut out the eyes. Either core and cut the pineapple into rings or slice the pineapple from the core; marinade in a good Rutherglen Muscat for 4 hours. Heat the grill to hot and place the pineapple slices on, watching carefully as they will char very quickly. Turn once and ensure you get good grill lines. Remove from the grill and crack rock salt liberally over. Serve with good quality vanilla ice cream if desired.